Orphan Black promised to open up a new chapter in the cloning conspiracy—and boy, did it pay off on that promise. We're more excited than ever to see what's ahead for Clone Club, and a brand-new faction in the Orphan Black world. We open in Siobhan's home, with Felix still drugged and feeling guilty about failing to recognize that Rachel wasn't Sarah while Sarah screams at Siobhan until she comes to a conclusion: she'll trust Siobhan where Kira is concerned. Interspersed are scenes of Sarah's other decision. She has turned herself over to Dyad. Rachel has decided that there will be no more warm and fuzzy conspiracy chats with doctors like Leekie, no makeouts with Delphine while she treats Cosima. The clones will not be guests of Dyad; they will be property. That's clear when Sarah turns herself over and she's inspected and manhandled and asked all sorts of invasive questions. When she reveals that she's had an abortion, it feels like we, as the viewers, have crossed a line into learning things about Sarah that are none of our business. But at this point, Dyad thinks that everything about Sarah is their business. Delphine, meanwhile, is sent off to Berlin against her will, but not before she sneaks Rachel's itinerary to Cosima. Rachel is still hoping that she can resolve her infertility by breaking Ethan's encryption on the synthetic sequences and has her father—now treated even more as a prisoner—brought to her room of crazy video nostalgia. I wonder if Rachel had come to him as a daughter who desperately wanted a child if Ethan might have considered helping her out, but he's so determined to keep the synthetic sequences out of Dyad's hands—to keep more clones from being made—that he would rather kill himself than turn over the cypher key. For Rachel, this must be the final betrayal of her father who made her barren, who stayed away while Leekie raised her, and who now will leave her barren. Well, at least she still has Sarah and her big, beautiful ovaries. Donnie, Alison, Angie, and Vic have already finished their arc for the season, but Orphan Black marshals the rest of its characters to free Cosima, Sarah, and Kira from Dyad's clutches. Kira steals a medical technician's cell phone (really, Dyad should have policies about carrying phones near anyone clone-affiliated) and calls Cal. Cal shows up on Siobhan's doorstep with the information that he has a high-up ally inside the corporate cabal that controls Dyad—one who references a mysterious Castor, a reference to the myth of Leda. Siobhan cuts a deal with Paul. And, of course, Cosima and Scott MacGyver up a gun out of a fire extinguisher and use Kira to send Sarah the message to use it. Rachel, desperate and petulant, may have smashed all the vials of Kira's bone marrow, but at least Sarah and Cosima get back at her in the eye. I wonder if Rachel's days of impersonating the other clones are over, or if Dyad has some means of regrowing eyeballs. Oh, and surprise! Marion Bowles is Cal's corporate contact. She tells Sarah that she'll reveal all if Sarah comes to meet her. Yes, please. In the meantime, Helena shows up at Art's—or rather, in Art's kitchen. When did Art become the clone wrangler? Anyway, she doesn't reveal that she's pregnant and she's rather coy about burning down the Prolethean compound. But Felix brings her back to his apartment for the Clone Club sleepover. This is Helena's official initiation into Clone Club, and it's a stark contrast to last season, when she was the fearsome clone killer. The clones are no longer fakes, no longer non-persons. They are her sisters, just as Sarah is her sister. And if Cosima or Alison had any doubts about Helena, they melt away when Helena interacts with Kira. First thought about this sequence: the special effects team must have worked overtime here. Of course every clone has her own dance style. That's cool. The showrunners are clearly excited about reuniting Clone Club. This is kind of indulgent, but fun. Wait, how long does this scene go on? Is this the rest of the episode? Eventually, the dance party ends and Helena takes a moment to sniff the trucker hat from the guy she flirted with a few episodes back and gets herself kidnapped. I know that Clone Club is pretty attached to Felix's apartment, but at this point, everyone knows about it. It might be time to find a new hideout. With Helena's penchant for wildness, chances are Clone Club will assume she took off on her own. After chatting with Cosima about sacred geometry and propagating against all odds, Sarah leaves for Marion's house. 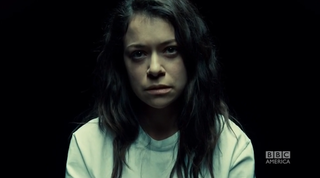 Kira finds Cosima asleep in Felix's bed and there's a tense moment of "Oh god, Cosima, don't walk into the light." Cosima and Kira have story time, during which Kira produces Ethan's copy of The Island of Doctor Moreau—with all of Ethan's notes about Project Leda in the margins. But will Cosima survive long enough to develop a treatment based on the synthetic sequences? At Marion's, Sarah meets a girl who looks very familiar, played by the same actress we saw in Rachel's tapes from her childhood. It turns out that the clones have a little sister—just one—the product of a heart-aching 400 implantation attempts. (Given that the clones were secretly implanted at IVF clinics, it's horrific to think of all those miscarriages foisted upon unwitting women with fertility issues in the name of science.) Marion isn't just the woman Rachel treats as a surrogate mommy; she's the actual adoptive mother of this young clone. And her love for her daughter outweighs her loyalty to her corporate cabal. So she's going to let Sarah—and us—in on a major secret. Dyad handled only one set of clones—the girl clones. A military branch of the cabal handled…the boy clones. Oh god, it's Mark—or rather, a Mark clone. Mark isn't just AWOL from the Army. He's AWOL from the CLONE ARMY. Mark is a clone trooper. Oh, and he's marrying Gracie. Paul, meanwhile, has been working with this military branch—which kidnapped Helena with Siobhan's help. This opens up so many questions. Does this mean that the boy clones were all raised self-aware? If the male clones were raised for military purposes, what was the purpose of the female clones? And what does the military arm want with Helena? And what sort of craziness does this mean for the next season? Clone dance party gifs from the Orphan Black Tumblr.